Climate change is predicted to be one of the main drivers of ecosystem change into the future, causing biodiversity loss and increasing the potential for catastrophic and irreversible ecosystem regime shifts. Ecosystem regime shifts, are characterised by a shift from one stable state to another, after going beyond a crucial tipping point. Sub-Antarctic fell field ecosystems have specific characteristics that may make them susceptible to regime shifts. They have patchily distributed resources (specifically moisture) and species that act as ecosystem engineers (keystone species) that control the distribution of these resources. Despite the importance of understanding ecosystem regime shifts, particularly in response to the increasing pressure that a changing climate has on the environment, few empirical examples and quantitative data on the process exist. The sub- Antarctic fell field ecosystem on Macquarie Island has over the past few decades, experienced a shift in weather conditions that includes a uniform increase in sunshine hours and wind speed. This has led to higher levels of evapotranspiration and dryer conditions overall. In addition, the now critically endangered cushion plant, Azorella macquariensis (Apiaceae), a keystone species on Macquarie Island, has significantly declined to levels that could trigger a regime shift in this important ecosystem . This project will quantify the traits of this ecosystem engineer that are responsive to shifts in climate, and determine the distribution and abundance of potential refugia, locations on the Island that offer protection from changes in climate. 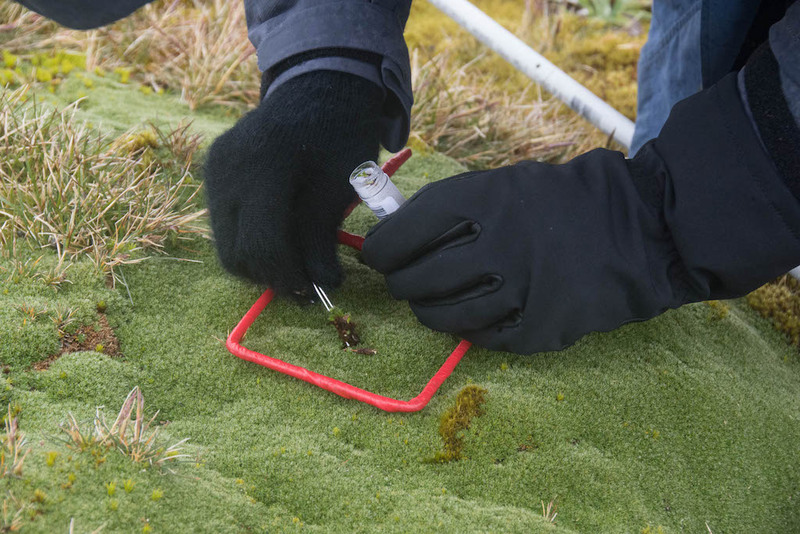 From these data a predictive model of Azorella macquariensis range contractions in response to changes in climate will be developed, which will be applicable for management of sub-Antarctic environments more generally. Project participants: Melodie McGeoch (Monash University), Dana Bergstrom (Australian Antarctic Division), Benjamin Raymond (Australian Antarctic Division), Justine Shaw (University of Queensland), Aleksandrs Terauds (Australian Antarctic Division), Jennifer Whinam (Department of Primary Industries, Parks Water and Environment). In November 2017 Cath Dickson (PhD Candidate) and Rowena Hannaford (Research Assistant) returned to Macquarie Island for two months for the final field season of AASP 4312 Nowhere to Hide? Conservation options for a subantarctic keystone species. The primary aim of the season was to retrieve the microclimate (temperature and humidity) data-loggers from each site, which had been established during the previous 2016/2017 season. 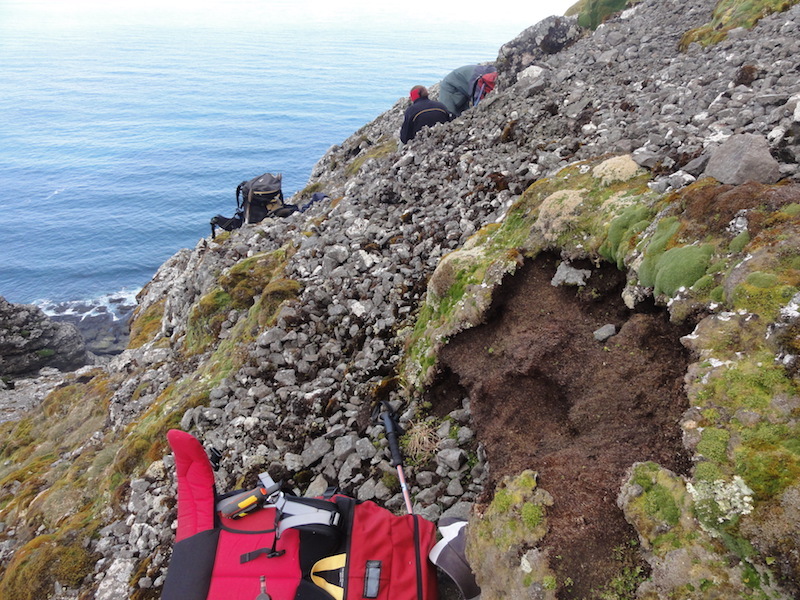 Together the team also resurveyed the extent of Azorella macquariensis cover and dieback, the proportion of growth classes affected by dieback and refined data on soil characteristics at the 82 sites across the extent of Macquarie Island. 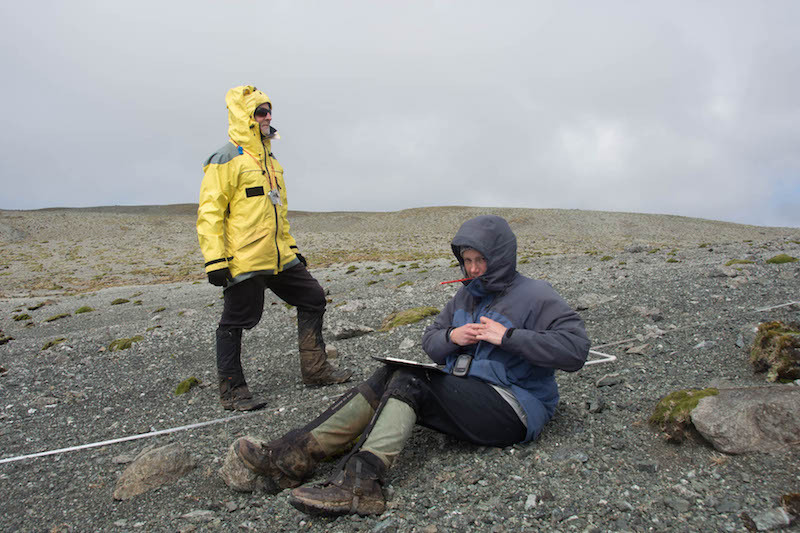 It was a highly successful field season, with a complete set of microclimate data recorded from all sites. The microclimate data set is currently in the initial phase of analysis. The team are looking forward to determining the relationship between microclimate and Azorella dieback as the first step to understanding if and where Azorella microclimate holdouts (refuges) potentially occur on Macquarie Island. PhD student Cath Dickson recently presented a poster on Nowhere to hide? Conservation options for the sub-Antarctic Macquarie cushions. Developing the evidence base for management at the 11th Australasian Plant Conservation Conference. Cath investigated the response of the Azorella genus to climate change across the sub-Antarctic and South American sub-continent. The scientific evidence for the Azorella genus and fellfield ecosystem’s response to climate is comparatively limited. However, Azorella condition will likely be highest in areas of lower potential evapotranspiration under climate change scenarios. The poster won the Student Poster Prize for the conference. The biennial conference’s theme was New Approaches to Plant Conservation Challenges in the Modern World, stimulating important discussions on integrating science and management to meet the challenges from increasing urbanisation, small populations and land-use intensification under changing climates. 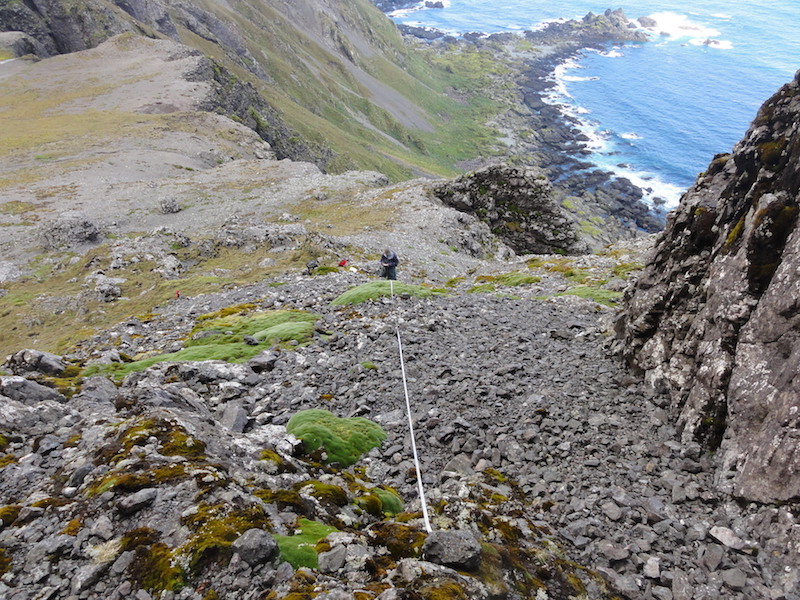 In December 2016 project team members Dr Dana Bergstrom (AAD), Dr Jennie Whinam (UTas) and Cath Dickson (PhD student, Monash) began field work on Macquarie Island to determine the distribution and abundance of potential refugia for Azorella macquariensis. December 2016 set three monthly weather records, which resulted in a very wet, windy start to the field season. However, despite the weather the team succesfully established half of the temperature and humidity data-loggers and refined the field methods before the New Year. Throughout January and February, Cath and John Burgess (AAD) travelled across the island to finish establishing the microclimate data-loggers, take leaf samples and complete condition and microtopography assessments at all 62 sites. The site assessments were undertaken in four broad terrain classes, encompassing a diversity of microtopography. The sites ranged from very steep highly exposed slopes, to exposed fellfield peaks, to wetter short grassland turf on sheltered or gentle slopes. Azorella dieback was recorded across the island, however, the severity and levels of recovery varied between sites. Cath is looking forward to analysing the resultant data in the year ahead. Cath and Alison Skinn assessing a site south of Mt Waite. John and Cath undertaking a site assessment on Mt Haswell.